of the MAAA, dedicated to track and Field in Montserrat.... Your support and Sponsors made it possible... Thank you.... Any questions or comments please email me at ikbarry@lycos.com or at ikkyb61@hotmail.com or leave a message on the message board. Please take some time out and leave us a comment. Let us know how your experience was on this site. Note: These records are for Montserratians living abroad and do not run for Montserrat. World Female Athlete of the Year Sanya Richards believes Justin Gatlin's ban for doping offences has cast a shadow over athletics in the United States. 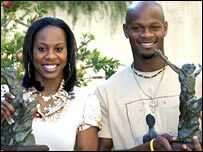 Asafa Powell and Sanya Richards have been named as the International Association of Athletics Federations' World Athletes of the Year for 2006. Powell claimed his first major 100m gold for Jamaica at the Commonwealth Games in March and remained unbeaten in all 16 finals he contested. The 23-year-old also twice equalled his own 100m world record of 9.77 seconds. 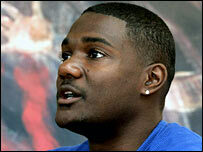 Richards, 21, was also unbeaten over 400m and clocked 48.70 seconds to break the 22-year-old American record. Calender brought to you by "stratsfinest"
Would you like to send us a donation? Visit IAAF for more events. Melbourne 2006 Commonwealth Games Aus. Copyright 2006-2007 Montserrat Amateur Athletics Association. All rights reserved.